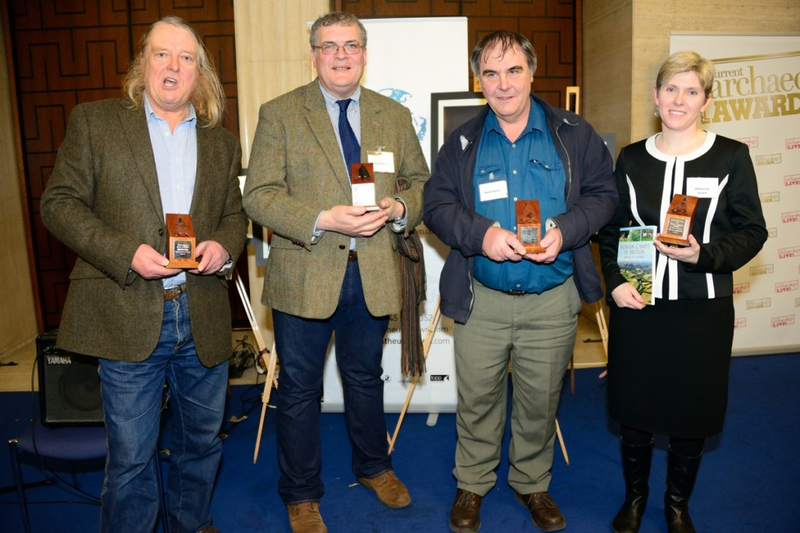 Accepting the award for Archaeologist of the Year was Phil Harding. A household name following his appearance on 20 seasons of Channel 4’s Time Team, Phil’s enthusiasm for archaeology has inspired countless others to enter the discipline. As well as digging at some of Britain’s most iconic sites with Time Team, Phil is also a senior field archaeologist at Wessex Archaeology. He is honorary President of the Defence Archaeology Group, a tri-service extension of Operation Nightingale, the MOD initiative using archaeological fieldwork to help the recovery of injured servicemen. Despite the announcement of Time Team’s cancellation by Channel 4 at the end of last year, the programme has secured a lasting legacy by cementing archaeology in the public consciousness. ‘Stone the crows, I am not used to making acceptance speeches, but thank you to everyone who voted in the Current Archaeology Awards – not just those who voted for me, but everyone who registered their feelings about any of the projects. It shows how important archaeology is. Top honours for Research Excavation of the Year at the prestigious Current Archaeology Awards went to University of Leicester Archaeological Services’ international headline-grabbing discovery of Richard III under a Leicester car park. This astonishing achievement has finally allowed the lurid comments by Tudor chroniclers about the physique of this most controversial king to be objectively assessed. Accepting the award was the project’s lead archaeologist Richard Buckley. He said: ’I am very grateful that the readers of Current Archaeology have chosen our project as Research Excavation of the Year – for me, what is really nice, having done so much archaeological work in Leicester over the decades, is that this discovery has focussed international attention on Leicester’s fantastic archaeology, which is some of best in Britain. The award for Rescue Dig of the Year was accepted by Keith Parfitt on behalf Canterbury Archaeological Trust for their work at Folkestone Roman villa. First examined in 1924, coastal erosion prompted a re-examination of the site before it was lost forever. This revealed that the villa overlay a major Iron Age port of trade receiving large quantities of imported high status continental goods. ‘The people of Folkestone will be so pleased to see this project recognised. Prior to our excavations, no one had seen the villa for 50 years so it was great that the local community could visit the site during our excavations. ‘I am very touched to have won – this book is based on research that I have been doing for a very long time, and to have this recognition is a great honour and a privilege. I would like to dedicate this award to my husband and two children. Current Archaeology, is one of the UK’s leading archaeology magazine, announced the winners of their 2013 awards, presented by archaeologist and TV personality Julian Richards (of Meet the Ancestors fame) on March 1, as part of the annual Archaeology Live 2013 conference, held at the University of London’s Senate House.